Confession: I’ve pretty much said RIP to Snapchat from a business perspective. Now, don’t get me wrong. There are still opportunities when I would HIGHLY consider using Snapchat – if the opportunity and audience was right. However, Instagram just kills it with capabilities. If Instagram stories isn’t in your toolbox yet – it should be. And though Instagram Stories started off similar to Snapchat, with the ability to capture life “in real time” the advanced capabilities are making it easier for brands to deliver other forms of short-video content to mobile devices and Instagram users. I’ve taken a few months to ‘play’ a bit with some of the newest apps available for mobile devices that will help you better brand your Instagram stories while adding variety to your content and capabilities to the Instagram Story ‘vehicle’. 1. Create static branded images with photos and text. Okay. Technically, you can do this if you have even the basic PhotoShop skill set. You can create a blank canvas in PhotoShop with an aspect ratio of 9:16 OR 1080 w x 1920 h in pixels. Assure your design is vertical and portrait oriented. This will allow you the creative freedom to really create any kind of design that you want with text, images, shapes, etc. If you want to create static image designs on mobile, my favorite app to do so is Phonto. Phonto allows you to choose a solid color background, add text with a great variety of fonts and even add images or shapes to your creation. This app is also great for re-sizing screen shots or “matting” a square photo for Instagram Stories. Though there are many apps that will essentially do the same thing, Phonto is my favorite for the color variety and available font variety. 2. Animate your Instagram stories. Consider animation a “step up” from the static image we talked about above. Similar to a PowerPoint slide show, animation will add a bit of “movement” to your Instagram stories by animating text and graphics (think text that “flies” in, appears, zooming out, zooming in – similar to how you would animate a PowerPoint slide). My favorite app for this is Adobe Spark – and typically, l will use a premade template and change and brand it to my liking. The app has a bit of a learning curve, but the short :15 second animation was “made” for Instagram Stories. Adobe Spark has a variety of fonts as well as background patterns and the ability to use stock images and import logos on your content. There’s a slight learning curve with Adobe Spark, but it’s a unique type of content that will add a little “spice” to your Instagram stories. Adobe Spark is another go-to for static images. I find their premade templates great for inspo. I find this only a “tad” bit awkward, so I know there will be a time when screen recordings will be a valuable, visual way for brand and people to communicate via Instagram stories. If you are an Apple iPhone user with iOS 11, you simply just need to turn the screen record feature on and add it to your Control Center. To do so, navigate to Settings >> Control Center >> Customize Controls. Click on the ‘+’ next to Screen Recording and add it to your Control Center. To record, simply swipe up from the bottom of your screen to access your Control Center and you will see a white “Record” button that will record your phone screen activity. Now, this can be a little weird. There is no pointer device so sometimes it’s hard for a user to see exactly what you are selecting as you open and close apps and paths on your device. But, let’s say you are typing in a URL and just want to show off a mobile website or a quick scroll – this app is great for that. Want to record a YouTube video? Okay, kind of illegal, but you can do it via the screen record. Yes, it takes sound too. 4. Post Short Video… but edited with cool music and cropped correctly to fit the Instagram Stories landscape. There are multiple ways to post short video in Instagram Stories. You can SHOOT the video on your phone in Instagram stories, but stories does not provide you the ability to edit, add music, crop your video or any other slight “upgrade” that may increase the quality and entertainment value of your video. So here are my must-have apps for Video Editing. InShot is one of the easiest tools to use with a plethora of options. I find InShot even easier to use than iMovie – iMovie’s biggest downside being that it’s difficult to crop, rotate or change the dimensions of the video file you are working with. InShot will let you add video clips together to create a new video, add background music, cut and edit clips as well as help to resize your video across a wide variety of image dimensions that will make it easier to post on Instagram Stories. You can add stickers, change the speed and create a colored background. Try editing a few clips into a :15 second Instagram story so it’s less “Instagram story-ish” and a little more “quality” and branded. There is a cost to upgrade and get rid of the inShot watermark, but let me remind you – this is a business expense! 5. Make a video collage. I’ve wanted to do this ever since I saw Gary V’s team do it. His style is very unique – the best way to describe it is 1-level up from average Instagram stories, but still reflective of how the platform and tool should be used. The app PicPlayPost allows you to create video collages with a 9:16 aspect ratio, the correct ratio for Instagram Stories. It’s incredibly easy to zoom IN on the video to re-crop to the collage’s reserved spaces. It may take a while to find a layout that works with the video you have shot, without having to recrop or rotate video. I went with a simple three-across for this example which allowed me to easily keep the dimensions of the video the same they were shot-in with my iPhone. You can have videos play all at once (which is kind of cool) or play in a sequence (which is also cool). Just remember to keep you video edit under 15-seconds. There are cropping tools within the app. You can also add music or mute the video music of the videos you’ve imported – for a little bit of edge. I posted this photo to Blend’s assets recently and I got great positive feedback on it. I merged a bit of branding with my videos by electing for the middle to be a static image. You can also use a gif or an animated image in any of the boxes, allowing you to essentially create stories extremely similar to Gary’s example. Try using an app like Phonto (that we mentioned above!) which will help you create text and photos around your image. 6. Brand + Properly organize your highlight reel. The highlight reel is fairly new – and while I find it less relevant for personal use, I find it extremely value for brands. In case you aren’t up to date, HIGHLIGHT function saves your Instagram story to your profile so it can be viewed later. They are kind of like… saved folders for your favorite stories. This is prime real estate for your brands. Use this area to featured some of your most current or favorite Instagram stories organized by function. Brands can feature their products, product function and important information easily and visually. It’s also a prime opportunity to bring some of your colors, branding and even logos to your Instagram main profile page. I’ve designed the following example with Photoshop but this can be easily done through apps like Phonto as well. Assure that whatever you use can be easily cropped in a small circle. 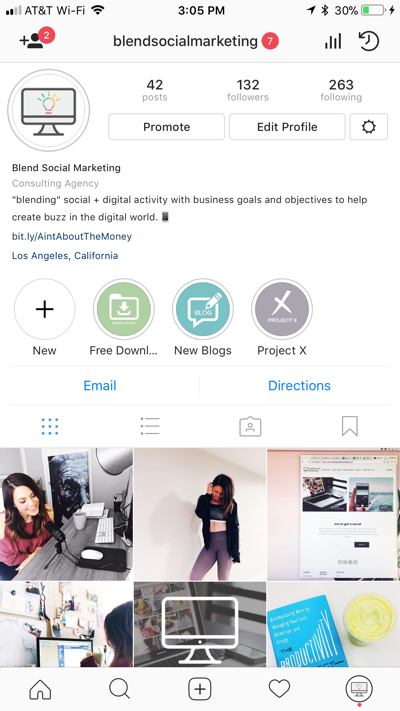 To create new highlight covers, simply post to your Instagram story, add to the specific highlight you want to create a cover for and click on that highlight from your profile. In the bottom right hand corner is a button with three dots that says MORE, open and click ‘Edit Highlight” then ‘Edit Cover’ to choose a new cover. The cover must stay in the highlight in order to be used as a cover.